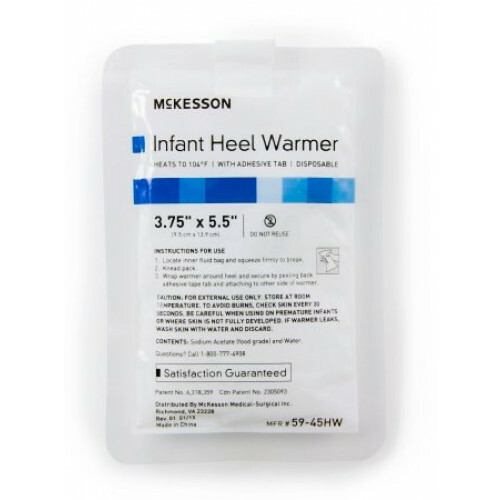 The McKesson Infant Heel Warmer allows medical professionals to increase capillary circulation in an infant's heel, which allows them to facilitate easier heel stick blood collection. It creates activation results using an exothermic reaction. 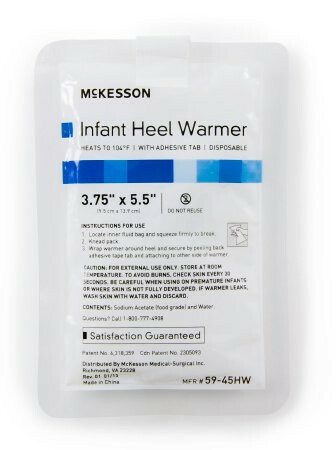 The McKesson 59-45HW Instant Activation Infant Heel Warmer provides a maximum temperature of up to 104°F within the first few minutes of use. It comes with a secure adhesive strip that holds the warmer in place while the active gel conforms to the infant's foot. This heel warmer contains non-toxic material and comes in a pouch made from PE/nylon (2.5 mil clean PE + 60g/m² nylon). It is not made with natural rubber latex and designed for single use. It is the ideal instant chemical heat pack that is used often and routinely in neonatal care settings. You may also be interested in the MedLine Infant Heel Warmer, on sale at Vitality Medical today.